1. In a medium bowl, combine cornmeal, flour, baking powder, salt, and sugar. 2. In another bowl, whisk egg with milk and corn. Stir in the melted butter. 3. Combine the two mixtures, stirring just until blended. 4. Bake in a preheated and oiled waffle iron until crisp, following manufacturers' directions. 5. Meanwhile, to make the sauce, cook blueberries, sugar, and water on medium-high heat for 10 minutes. Turn heat off and stir in orange zest. 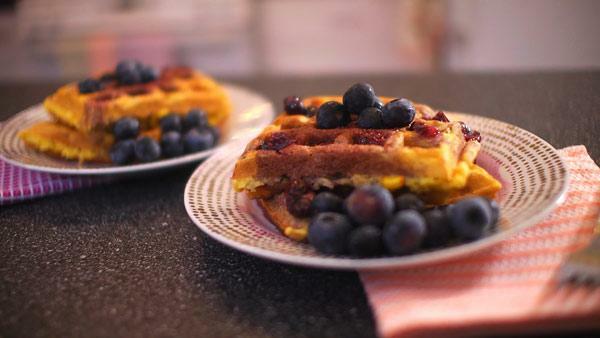 Serve immediately over waffles while warm.